I'm currently in south Louisiana for a wedding and am enjoying some wonderful southern hospitality. This is my first trip to Cajun Country (minus a couple trips to New Orleans in college) and I am loving the accents, the food, and the weather! I snapped these photos before I hopped on the plane yesterday. 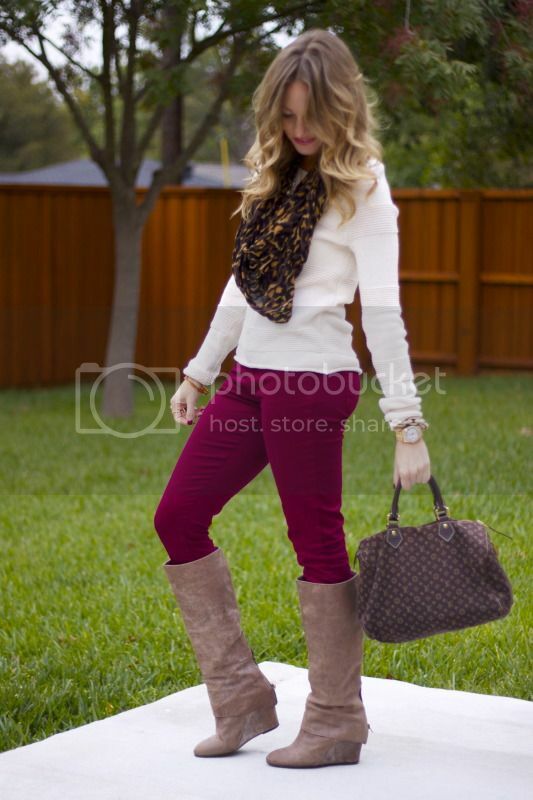 A cold front blew into Dallas and I was so thrilled to be wearing boots and a sweater. I obviously am still loving my maroon skinnies that I got a couple weeks ago that you last saw here. They are so soft and comfy and I am so glad that I didn't ruin them when I accidentally left them in the dryer. They didn't even shrink. I wanted to get y'alls advice and input on what you'd like to see more of on the blog. I have a couple things in mind, but I'm not quite the best judge of an audience. I don't want things to get boring around here, so let me know what you want! I'm open to anything. Hey there! Thanks for the input! Today I ate McDonald's, so I'm not sure that would work out, but I do generally eat very clean and love to cook. I will try and develop some workout and nutrition posts. Awesome idea! Hey Carla! I just got back and am absolutely exhausted. So much fun but back to the real world now! Thanks Tori! I needed something comfy to travel in and this was perfect! Love your outfit! I would love to know how you do your hair! Your curls are gorgeous! The hair is definitely a hot topic! I've been trying to decide whether or not to do a video or just a simple post (there's not much to it), but will certainly do something. Thanks for the feedback, Caroline! I'm loving the cooler weather we're getting in Dallas! Love this outfit! I love the color of your pants! I hope you're having fun in Louisiana! We go there every year for Thanksgiving! So pretty! Love the burgendy pant! I'm obsessed with them and really didn't think I would care, to be honest. Thanks for your input, Brooklyn! I have been trying to photograph my thriftventures lately, but the past two have sucked and I ended up with not a damn thing. Appreciate you stopping by! Love reading your blog and seeing your outfits--I wouldn't change much, except maybe to add the Pinterest app to your blog so I can pin your individual photos. I love your style! Awesome idea! I need to google how to do that, but great input! I will make it happen. Yay! I always scream when I see myself on Pinterest, don't you? ?